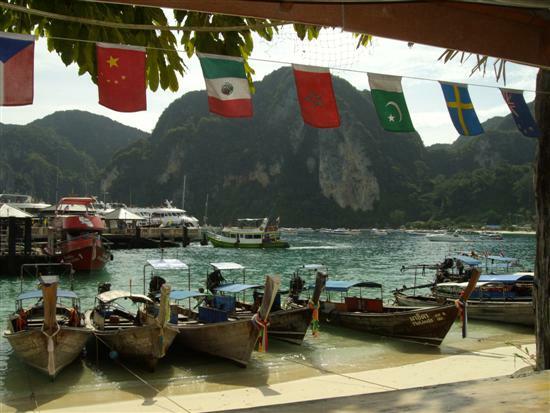 The trip to Phi Phi Island is described in this second part of my Ao Nang travel blog. If you want to read the trip report from the beginning then go back to the Ao Nang Trip page here. The next morning we took breakfast in the Peace Laguna hotel restaurant. Located upstairs in a covered outdoor area, the restaurant overlooked the large lagoon and swimming pool and was a magnificent setting, with the imposing limestone cliffs behind. It is typical of Thai holiday hotels to serve breakfast outside or outside under cover, particularly the further South that you travel. The climate in the tropics just makes it so more practical. Most of the other guests in the restaurant were Scandanavian family groups with young children, but there were also some Thais. I am not a big breakfast eater so can't really comment on the options available, but there was a mix of Thai and Western food on show and there seemed plenty of it. The pick-up to go to Phi Phi Island had been set for 8:30am at the front of the hotel. The songtaew arrived on time already half full of people from other hotels in Ao Nang. In this case the songtaew was a large truck with seating down either side. Once on board we continued to pick up more people along the way, before driving along the main Ao Nang beach road and then on to Noppharatthara Pier. Arriving at the pier I was pleasantly surprised to see how large the boat was, easily capable of holding a couple of hundred people. You can see a photo of the Ao Nang Princess further along, as it picked us up for the return journey in the afternoon. Even though it was still early in the morning it was pretty hot in the sun but we managed to find a spot outside on the shaded side of the boat and before long we set off. The trip to Phi Phi island takes approximately 90 minutes and stopping at Railey Beach on the way we picked up and set down some passengers. 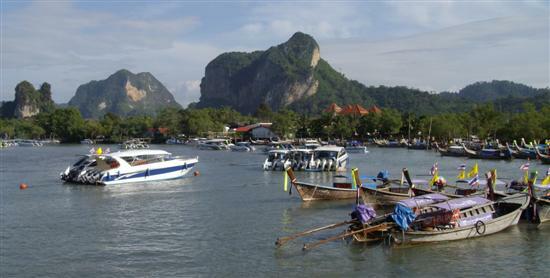 Railay Beach can only be reached by boat as there is no direct access by land and it looks an interesting place to visit. Arriving at Railey Beach, long tailed boats filled with departing tourists and their luggage headed towards us from the beach area. Passengers and their luggage were deftly swapped from small boat to large boat. Likewise passengers left the ferry and into the long tailed boats. Everybody on board was watching the transfer, just waiting for luggage or transferee to fall into the sea. On this occasion nothing went amiss, but then the sea was very calm. I can imagine that in rougher waters it would be a more difficult task to conduct this transfer and surely people or bags must take a dunking. 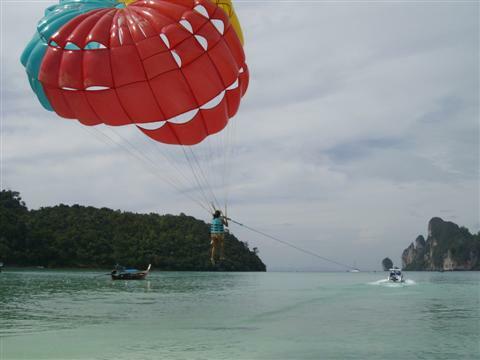 After the task was complete the Ao Nang Princess resumed the journey to Phi Phi Island and powered on through the waves. The breeze was warm and the Andaman Sea sparkled in the sunlight, occasionally we passed small islands in the distance. They were too far away to be able to get good photographs with my little pocket camera but we passed the time making friends with some fellow travellers from Europe. Chatting away we discussed our travels so far and wondered about what lay ahead. This was the first trip for us all to Koh Phi Phi. 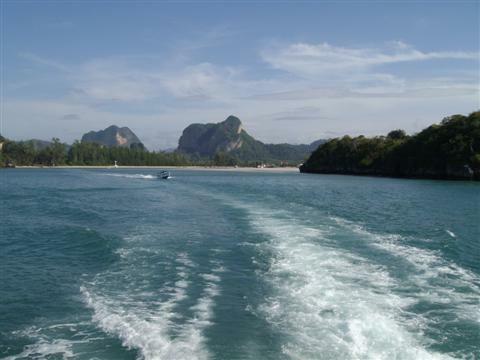 The time passed quickly as the Ao Nang Princess cut through the waves and towards 11:00am we started to approach Phi Phi island. Rounding the headland we could see a large bay with hills to either side and a jetty in the middle, it was nothing like I imagined Phi Phi to be. The bay was littered with every type of watercraft imaginable and the mountains towered over the bay with the rainforest canopy soaking up the sun. 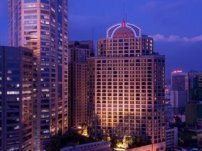 Since the Global Financial Crisis happened, many of Thailand's holiday resorts have suffered with a lack of tourists, but not so here. The jetty was full of hundreds of people either arriving or departing the island. Without doubt this was the busiest Thailand holiday resort in my recent experience, which just goes to show how popular Phi Phi Island is and the attraction that it holds for many people. There was no time for photographs, we had to get off the boat and negotiate the throngs of people. After disembarking the boat and shuffling along we realised we had to pay some sort of tax, which I think was about 20 Baht each. The ticket, which I retained, said, "Fee of the Parking Clean". I can only guess that this money is used for National Park maintenance. 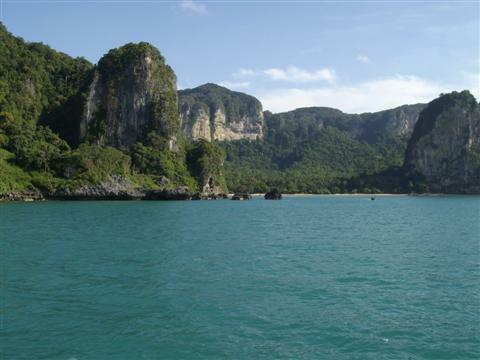 Phi Phi Island is comprised of two parts, Phi Phi Don and Phi Phi Le, which are joined by a strip of low lying land. On either side there are bays. One side is mainly for arriving boats and the other side is where the tourists lie out in the sun and absorb the rays. With no idea of where to go, we left the jetty and just followed the crowd of people. The return ferry was booked for 3:30pm, so we basically had about 4 hours on Phi Phi island to wander around. For me it was a reconnaissance mission; a brief visit to spy out the lay of the land and if it looked good, then plan to come back. After leaving the pier, Phi Phi Island seemed to be pedestrian only, as there are no roads as such, just alleyways between shops and houses and restaurants. Food and supplies for the hotels was all being moved by hand and then put into pushcarts and manually pushed around the island. You had to watch out for the carts coming up behind you. The sea was blue, the sky was blue and there was a light breeze across the water. We found a nice restaurant overlooking the small beach and sea and stopped there for some some lunch. From the restaurant we had a clear view of the boats on the water with the hills in the background. It was really quite a beautiful location and I began to see why there were so many tourists. Eating from a selection of Thai seafood and with no room for a dessert we settled the bill and wandered around the maze of alleyways and small sois. With no map of Phi Phi island we had no idea of where to go, often crossing our previous path or even retracing previous foot steps. I think that the phrase, "wandering aimlessly" is an apt description for what we did. There are shops, restaurants, small bars and guest houses all mixed together and spread across the island. It looked like you could just turn up and go from door to door to find accommodation. At one point we ended up on the other side of the bay to where the Ao Nang Princess had berthed. This area was where all the holiday makers were sprawled out on the beach and also where some brave souls were setting off paragliding. As we wandered about and watched, we saw people being hauled up into the air, suspended beneath a parachute, whilst a speedboat took them for a tour around the bay. Looked pretty exciting, but not for me. In a couple of locations on the island there were memorials to the more than 2500 people who lost their lives in the 2004 Boxing Day Tsunami, that swept over this island destroying most of the infrastructure in its path. The island has since been rebuilt, but these memorials pay tribute to the lost ones and remind current tourists of what happened that day. 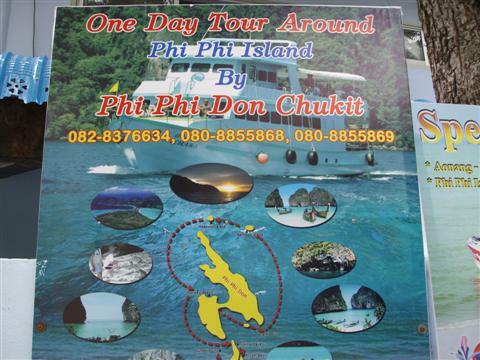 There are many tours that you can do once on Phi Phi Island. The scenery was fantastic and the beaches are fabulous, it is no wonder that it attracts so many tourists. At around 3:00pm, we set off back towards the jetty to get the ferry boat. Located just next to the ferry terminal are a selection of bars that you can stop and have a last meal, a drink of tea or even something stronger. Time was rapidly drawing to a close and the bar beckoned and I had a final drink overlooking the water, before leaving this magical island. The Ao Nang Princess left at about 3:30pm and as it headed back to Ao Nang we could see one of those afternoon thunderstorms that we had experienced the day before building on the horizon, in the direction we were heading. The wind was becoming stronger and the sky became darker and darker and before we knew it the storm was upon us. So strong was the wind, that I lost my hat as I stood up to go inside the boat and my hat shot over the side never to be seen again. It flew over 50 metres, and the passengers at the rear of the boat had a try at catching it, but to no avail. Having the advanced warning of the impending storm we took the chance to go inside the air conditioned part of the boat, whilst there were still plenty of seats and it was lucky that we did. Some brave souls decided they would remain on deck and put on their light plastic ponchos to brave the elements. But once the storm hit these brave people were battered by the driving rain and strong wind and with a sudden drop in temperature they came trooping into the safety of the inside rather sheepishly. The storm probably lasted 20 minutes before we got through it and then the weather cleared. We stayed inside the Ao Nang Princess until we reached our destination as it was too wet to sit down again outside. 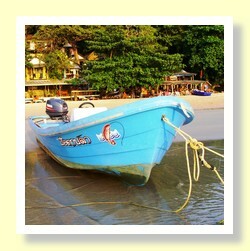 We again passed Railay Beach, once again capturing and releasing more passengers. Then it was past Ao Nang and to the pier to disembark. Meeting the passengers off the boat was a fleet of songtaew's and we were efficiently herded to the correct one for the drive back to the hotel. But you had to listen carefully to make sure you got on the right one. I am pretty sure that some people got on the wrong songthaew and of course it was bound to happen with the throngs of people and the general confusion about what was happeing. After we had driven a while a couple of people got off our songthaew in the middle of nowhere, obviously we were not heading in the right direction. More than likely they were not that proficient in English to understand the instructions given by the Thai guides. After a short drive, dropping people off along the way we arrived back at the hotel for a shower. The evening was spent again wandering the shops of Ao Nang and trying out some different bars. It gave us time to reflect on our trip to Koh Phi Phi and what we had seen. 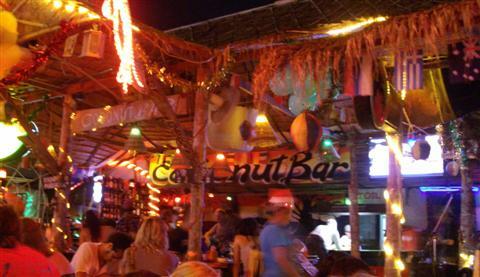 The Coconut Bar was close to the hotel and had a good atmosphere and some good music. 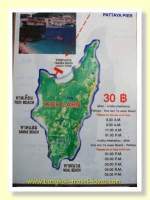 Koh Phi Phi is certainly a place that merits a return visit. The island scenery was breathtaking and the water was crystal clear, there were heaps of places to stay and trips to take and I reckon that you could go and spend several months there and not see and do everything. The following day was the last of this little sojourn and after packing and taking breakfast we had a look around the streets outside the hotel to find a cheap way of getting back to the airport. Just over the road from the Peace Laguna was a place advertising airport transfers, unfortunately the small shop was closed (or hadn't opened yet) but there was another shop not far away. Two tickets cost 150 Baht each to go back to the airport, which seemed reasonable. Returning to the hotel to get our bags and complete the checkout formalities we waited at the front entrance for the transport to arrive. After being called by the concierge we boarded a small 12-seater minibus that already had about 5 people on board. The bus looked okay from the outside, but mechanically I think the rear wheel bearings or back axle was about to give way. Each time we went around a bend there was the terrible screeching noise from under my seat. Obviously it was in need of some serious repair work. It did however get us to the airport in time to catch the Thai Airways flight back to Bangkok. 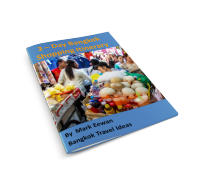 If you are thinking of going from Bangkok to Ao Nang then I hope you found a few ideas from my travel diary and that it inspires you to try something different. 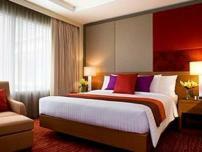 This was another great travel idea brought to you by Bangkok Travel Ideas.